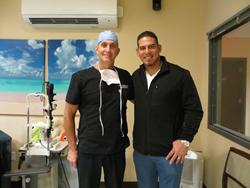 Wilson Ramos, starting catcher for the Washington Nationals, underwent LASIK surgery with Dr. Andrew E. Holzman. Thanks to custom LASIK surgery, Ramos' vision is now 20/15, which means that he can see better than people who have perfect vision. Many professional athletes are looking for a competitive edge, and sometimes that means seeing the game a different way. That's why Wilson Ramos, popular starting catcher for the Washington Nationals, recently underwent LASIK surgery at the practice of Andrew E. Holzman, MD, FACS. Thanks to the latest advances in laser vision correction, Ramos has achieved vision better than 20/20, and he's looking forward to a great season with the Nationals. Born in Venezuela in 1987, Wilson Ramos made his Major League Baseball debut with the Minnesota Twins in 2010, and was traded to The Nationals later in the season. In 2011, Baseball America named Ramos the catcher of its All-Rookie Team. Last season with the Nationals, Ramos had a career-high 475 at-bats, with 15 home runs and 68 RBIs. Thanks to custom LASIK surgery, Ramos' vision is now 20/15, which means that he can see better than people who have perfect vision. For perspective, that means that Ramos can see at 20 feet what a person with perfect vision can see at 15 feet. Ramos had been prescribed contact lenses to improve his vision, but he had trouble putting them in and dealing with the discomfort of wearing them. As a result, the team sent him back to DC from spring training so he could undergo LASIK with Dr. Holzman. Now that Ramos has undergone LASIK, he doesn't have to worry about irritated eyes or less-than-optimal vision. "We decided it was better [to have it] now than later," Nationals manager Dusty Baker said. He then jokingly added, "He will be able to hit now." With better than perfect vision, Ramos has his sights set on a great regular season. Ramos' issues with contact lenses are not unique. Many people have difficulties when trying to put contacts in or take them out. Complaints of discomfort are not uncommon either, which is one of the many compelling reasons why people choose laser vision correction surgery over contact lenses. For athletes of all levels, LASIK offers a host of advantages over contacts. When athletes don't have to worry about discomfort, losing a contact, or their glasses falling off, they gain an edge in their game. The overall safety and effectiveness of LASIK is a major reason why people choose laser eye surgery over traditional corrective lenses. Thanks to modern digital mapping technology and computer-guided laser systems, modern LASIK is much safer than it's ever been. The risk of human error is extremely low, which means a problem-free and speedy recovery. In fact, just days after undergoing LASIK, CBS News reported that Ramos felt well enough to get back in the game during spring training. Results like Ramos' are not uncommon. While 20/15 vision cannot be guaranteed for everyone, custom LASIK surgery has allowed countless people to see clearly without the need for glasses or contact lenses. For more information about LASIK surgery and other options for advanced vision correction and eye care, contact the practice of Dr. Andrew E. Holzman. His offices in the Washington, DC area can be reached directly by using the contact information provided below. Originally posted by Andrew E. Holzman, MD, FACS.